The free-living protozoa of litter and soils belong to two Phyla: the Sarcomastigophora and the Ciliophora (Levine et al., 1980). For practical purposes, we consider them in four ecological groups: the flagellates, naked amoebae, testacea, and ciliates (Lousier and Bamforth, 1990). 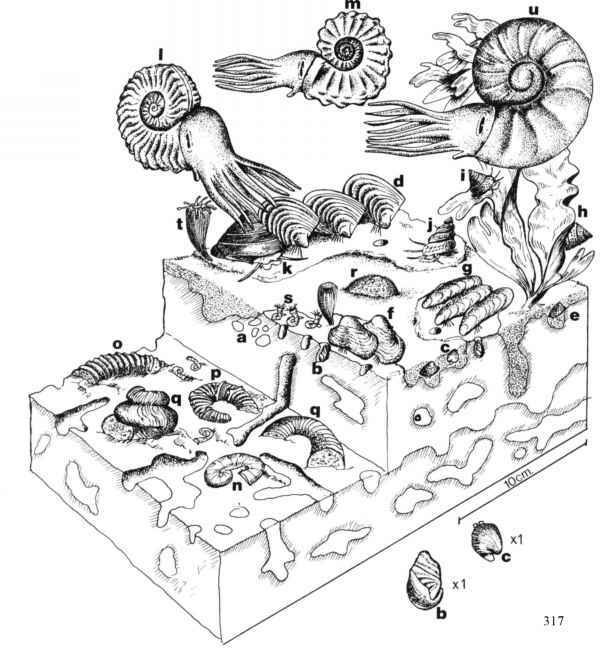 A general comparison of body plans is given in Figure 4.5, showing representatives of the four major types. After a brief overview of the groups, we will consider aspects of their enumeration and identification. FIGURE 4.5. 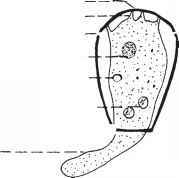 Morphology of four types of soil protozoa: (a) flagellate (Bodo); (b) naked amoeba (Naegleria); (c) testacean (Hyalosphenia); (d) ciliate (Oxytricha) (from Lousier and Bamforth, 1990). 1. Flagellates. Named for their one or more flagella (whiplike propulsive organs), these are among the more numerous and active of the protozoa. They play a significant role in nutrient turnover by their often-intensive feeding activities, with bacteria as their principal prey items (Zwart and Darbyshire, 1991; Kuikman and Van Veen, 1989). Numbers have varied from 100 per gram in desert soils to more than 105 per gram in forest soils (Bamforth, 1980). 2. Naked Amoebae. These are among the more voracious of the soil protozoa, and are very numerous and active in a wide range of agricultural, grassland, and forested soils (Elliott and Coleman, 1977; Clarholm, 1981, 1985; Gupta and Germida, 1989). The dominant mode of feeding for the amoebae, as for the larger forms such as Ciliates, is phagotrophic (engulfing), with bacteria, fungi, algae, and other fine particulate organic matter being the majority of the ingested material (Bamforth, 1980; Bryant et al., 1982). The highly plastic mode of existence of the naked amoebae is impressive; they have the ability to explore very small cavities or pores in soil aggregates and feed upon bacteria that would otherwise be considered inaccessible to predators (Foster and Dormaar, 1991). 3. Testate Amoebae. When compared with the naked amoebae, testate amoebae are often less numerous, except in moist, forested systems where they thrive. However, they are more easily censused by a range of direct filtration and staining procedures (Lousier and Parkinson, 1981). Detailed community production and biomass studies of testacea have been carried out in forested French sites by Couteaux (1972, 1985) and in Canadian aspen forest lands (Lousier and Parkinson, 1984). For example, Lousier and Parkinson (1984) noted a mean annual biomass of 0.07 gram (g) dry weight •m-2 of aspen woodland soil, much smaller than the average annual mass for bacteria or fungi, of 23 and 40 g, respectively. However, the testacean annual secondary production (new tissue per year) was 21 g dry weight •m-2, or essentially the entire average standing crop of the bacteria in that site. Certain genera of testacea are also diagnostic of soil types. Foiss-ner (1987a) notes that pioneer soil scientists, such as P. E. Mueller in the 1880s, were able to differentiate between mull and mor forms of humus by the kinds of testacea found (Table 4.1). They used ratios of abundance of forms, rather than exclusivity of presence or absence.